The 4th annual Fox Festival Parade will kick off the Feast of the East in Capitol Square on Saturday, June 15 at noon. 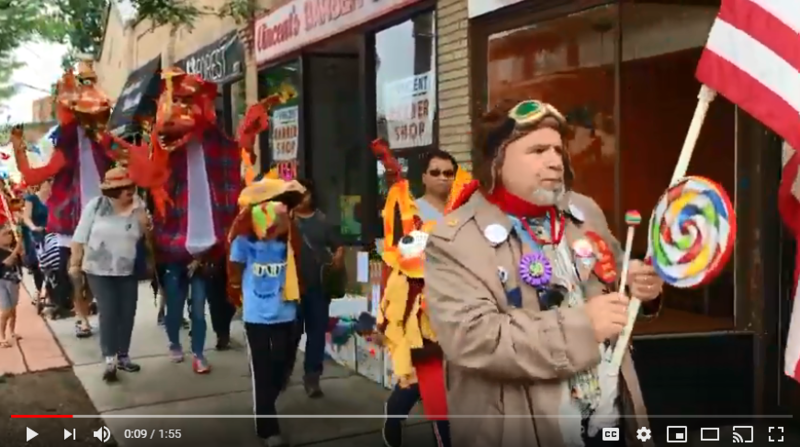 Please join us – this participatory parade was started to celebrate the Fox Library, community, creativity, and Arlington wildlife. It has grown to include messages of environmental activism of all kinds. Contribute your voice – come to a workshop or make your own costumes and signs. Are you concerned about climate change? Habitat loss? Ocean plastic? Speak up! Make a mask, banner or puppet inspired by local animals in a free workshop with artist Sara Peattie at the Fox Library. Kids can participate in afterschool workshops with Sara at the Thompson School. New family workshops at the Hardy School led by artist Kari Percival will celebrate the school’s mascot, the playful dolphin, and advocate for preserving the health of our oceans. You can also DIY – make your own costume, flag, or signs inspired by the theme of nature, animals, and environmental stewardship at home with family and friends. Know how to juggle or stilt? Twirl a baton? Play the kazoo? Want to make a giant moveable sculpture of a fox on wheels? Please join us! All are welcome in the parade. Gather at 11:45 at the Fox Library, 175 Mass Avenue. The Parade starts at noon and will be led by the wonderful Second Line Social Aid & Pleasure Society Brass Band! Scenes from Fox Festival Parade parade as participants are led down Mass Ave through East Arlington by the Second Line Social Aid and Pleasure Society Brass Band and Parade Marshall Joe Curro. But thanks in part to artist and library neighbor Shunsuke Yamaguchi, the fox has become the library’s mascot and a symbol of its survival of tougher economic times when the community rallied to save it from closing. Wild foxes also survive in Arlington thanks to habitat provided by the town’s remaining green spaces, including Spy Pond and the areas surrounding the Alewife Brook. Environmental stewardship is a core value in Arlington, and protecting urban wildlife is an essential aspect of this commitment. of stewarding our environment. So the fox is a mascot for something even bigger than the library — for community spirit and activism which works to make our neighborhood, and the world, a better place!